In his book Barbarian Virtues: The United States encounters foreign peoples at home and abroad, 1876-1917, Matthew Frye Jacobson rethinks the legacy of American industrial expansion bridging the 19th and 20th Centuries. This new scale of production required new markets, new consumers, and a government ready to support capitalism with its newly modernized military. The desire for economic expansion translated into a foreign policy that gave the United States a string of new territorial possessions that charted a path straight to the vast markets of China. The country demanded a growing influx of workers. Dependence on migrant labor and dependence on overseas consumer markets were two sides to the same coin. Large-scale immigration came social conflict with already established Americans. Jacobson makes a brilliant scholarly argument that Americans had a parochial understanding of the world’s peoples formed largely by national self-deception hiding its deep racial ambivalence. It may have needed indigenous, non-white populations as both immigrant workers in the United States and as consumers overseas, but it considered them as primitive and uncivilized in a visceral way. Significantly higher wages than in European countries made the hardships of immigration attractive. From coal mining to cotton factories and across a number of industries, first-generation immigrants constituted a large portion of the United States’ workforce. Jacobson argues that businesses leveraged immigration policies to maximize production and splinter worker attempts at solidarity by playing one race, nationality, or language off of another. This had the desired effect of depressing wages and suppressing any potential wage growth by fostering conflict between races. Management simply replaced white union workers who went on strike for higher wages or better conditions with non-white workers. In one example, Jacobson notes that 500 white shoemakers who went on strike in 1870 were replaced with Chinese strikebreakers. There was plenty of proof that the plan was working. Immigrants working for low, even such “low pitiful wages that they undermine Caucasians,” said The Atlantic Monthly. Arguments against foreign workers were more pronounced against the Chinese but, by the end of the 19th Century, grew to include southern and eastern Europeans and Jews. Jacobson reasons that Americans, exemplifying the dominant social attitudes and rhetoric of the century, may have wanted foreign markets and cheap labor but they definitely did not want its surplus population. Organized groups plotted actively against immigrant labor. White workers actively despised and spurned them for their different customs and habits. Immigrants who adopted white worker attitudes, including unionizing for mutual support, were chastised as belligerent. Those who accepted low wages and poor working and living conditions were called submissive or worse. Popular literature described them in racial terms as savage and heathens “quite beyond the reach of missionary effort.” No effort was given to understanding the economic circumstances and the degree of exploitation they suffered. Anglo-Saxons, the theories stated, were ahead of primitives along a timeline of civilization. The one-sided debate focused on non-white peoples abroad and their lack of fitness for self-government and a public questioning of the morals and character of immigrants at home. So-called scientific tests supported racist eugenic ideas on immigrant inferiority. The results showed them as less intelligent and incapable of self-governing. Immigrants were unfit for citizenship and a danger to the very fabric of American society. Many white Americans, including the nation’s elites, grew to fear the threat of fundamental change in the country from the invasion of immigrant workers through the “terrible little Ellis Island.” Likewise, Americans may have wanted the Philippines; Jacobson quotes the popular press of the day, but not the Filipinos. The country’s newfound sense of empire was for a path to China’s market and the Philippines were collateral damage on the path to a geopolitical imperial game, which Jacobson theorizes, would become standard fare for United States foreign policy through the course of the 20th Century. It was the moment, he argues, that the nation seized global power. This foreign expansion provided the relevance for Manifest Destiny and the foundation for Wilsonian internationalism, Cold War interventionism, and, one could imagine, failed interventions in the Mideast since the book was published. The true strength of Barbarian Virtues is the reexamining of this largely forgotten period in history. Without understanding the history of racism in immigration and foreign policy, the all too American sense of superiority forming the backbone of national identity will based on historical amnesia and mythology. 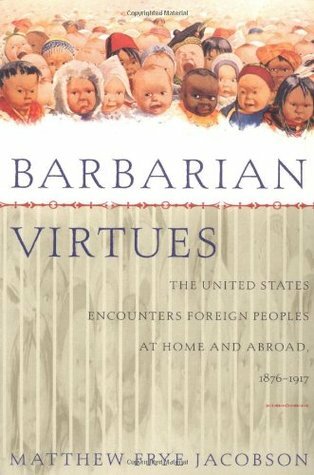 Matthew Frye Jacobson’s Barbarian Virtues is an American studies text that focuses on various discourses surrounding, as the subtitle suggests, the Unites States and its “encounters [with:] foreign peoples at home and abroad” between 1876-1917. In constructing this discourse, Jacobson uses travelogues, novels, court cases and their histories, published works, newspapers, cartoons, and other forms of political and social commentary to construct the United States between 1876 (the date of the Centennial Exposition in Philadelphia) and the first world war. What we end up with is a vision of the ways in which white people in elite positions in the United States reacted to immigrants and people of foreign lands they viewed as “waste spaces” (by their lack of sign of modern “civilization”). Jacobson’s new book works well with his older and more well-known title, Whiteness of a Different Color, which looked at the ways in which definitions over race have changed over time in respect to immigrants and which immigrants were viewed as full citizens and which weren’t. Barbarian Virtues for the most parts fills in the historical and social context in which Whiteness of a Different Color was placed. Barbarian Virtues at its core is a “synthetic treatment of immigration and foreign policy” (ix). Tracing first the ways in which the United States looked for new consumer markets to handle the U.S. surplus of goods and looking at the U.S.’s first failed attempt to tap the Chinese market and them more successful attempt to tap the Latin American market, we begin to learn of some of the U.S.’s imperialist notions in the late-nineteenth century. Jacobson also pays attention to the history of immigration in the United States and the ways in which these diverse people were treated in the popular imagination. Both narratives of the U.S. looking for new consumers in foreign lands and looking for new immigrant workers to produce the surplus, we see the ways in which the American economic system depended on people from outside of the United States to line the pockets of the elite in the U.S. Jacobson uses travelogues, fiction, and cartoons to show the ways in which foreign people both abroad and inside the United States were held up to changing American notions of who is civilized and able to be assimilated into Euro-American culture and who is not. Then he does this same analysis using scholarly literature to look at the eugenics movements, scientific racism, and other ways in which science deemed some nationalities or races as less than Euro-Americans. Finally, in the last section, Jacobson focuses on U.S. foreign policy and looks at U.S. expansionism and imperialism and its effects on how the U.S. constructed “foreign people”. He reminds us, “The second piece of public amnesia addressed here concerns turn-of-the-century empire-building, an area even more striking for the totality of its disappearance from popular discussion. Current renditions of U.S. history thoroughly expunge the Philippine-American War and related engagements in Cuba, Puerto Rico, and Guam to the extent that these warrant not even a paragraph in many high-school textbooks, and scarcely that in many college texts. Not only do most Americans know nothing about the conduct of the Philippine-American War, many do not even know that such a war took place.” (263) In this context, Jacobson reconstructs U.S. immigration and imperialist history to remind readers of how the United State came to be a world economic power. Instead of the popular history that the world handed us our power during the world wars, we see how U.S. policy decisions impacted the ways in which we dealt with the world and all of its people. I'd say if you've read Gary Gerstle's American Crucible you don't really have to read Barbarian Virtues, but it's a solid study nonetheless. It's mainly about the period of the late 19th and early 20th centuries in which America was coming into the international scene in 2 ways. 1. By gaining a global empire and millions of new subjects from different races. 2. The influx of millions of immigrants, mostly to work in America's burgeoning industrial scene. There were several inherent conflicts here: the US needed the cheap labor power of these immigrants, but was concerned with their racial impurities and cultural differences. The US wanted an empire to fulfill its manifest destiny, gain access to foreign markets, and compete in the international geopolity, but gaining that empire meant coming into control over millions of racially problematic peoples. Jacobsen explores how Americans dealt with these tensions in pop culture, immigration law, politics, foreign policy, science, and ideas. This was certainly a period in which Gerstle's racial nationalism dominated civic nationalism, and Jacobson does a great job charting its beliefs and practices. A well written and well researched historical perspective on the USA's love-hate relationship with its own white nationalism and imperialism. It is particularly important to understand these early years of increasing heterogeneity and industrial capitalism, before the State's more obvious, and egregious, global presence after WWII. More fundamentally, Jacobson forces us to recognize that white nationalism itself was, and continues to be, a colonization of America's non-white citizens. Awesome and thorough. We cannot understand empire without understanding how Americans experienced the cultures and people it came to exploit during this time period. I loved this book. Very good, broad based discussion on American Empire building on perceptions back home. An informative book written in an engaging manner - certainly worth your time if you're interested in learning more about the people of the US during Gilded Age and early twentieth century.